Journey To Italy is about the sacred union of man and woman... that of marriage and this tale is about a marriage that is on the verge of breaking point. The story revolves around Alex and Katherine Joyce who live in an emotional wasteland which they constantly feel the need for people. The story takes place during a week spent by Alex and Katherine in Italy, trying to sell a house that belonged to Alex's uncle who become increasingly jealous of each other as they socialise with different people. Amazingly enough, even in the midst of a world gone made, the two discover something between them that has been hidden away for years... that of love. 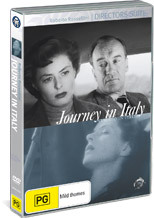 Journey in Italy is classic Hollywood at its best!